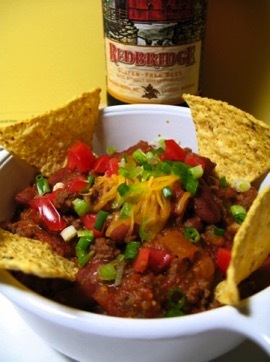 Chili is a fall/winter favorite around our house. It's quick to make and easy scale up if you want leftovers [Gotta love leftovers!]. Add ground beef and brown on med-high heat. Remove any excess grease. Allow chili to come to a good bubble and reduce heat to simmer. Simmer for 10 - 15 minutes. If chili becomes too thick - add more liquid of choice. Soup-like Chili with Pasta Note: Gluten pasta requires you to be be mindful of cross contamination risks. Make your favorite pasta and set aside. You might need to re-season this chili depending on how hot you like it. I tend to like my chili spicier than Peg, so when she adds the liquid and the pasta - it's about right for her tastes.